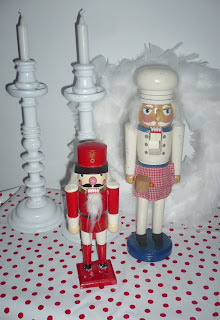 I was hanging out with a friend at the fleamarket, when I spoted these fabulous nutcrackers wich are just what I needed for the christmas decoration of the shop. 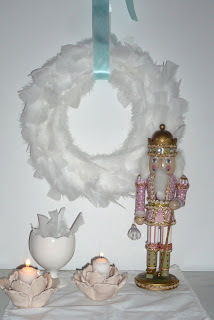 I made a feather wreath to complete the Vintage European Christmas look I was going for. Here I show two arrangements, one with a pale nordic look and a more colorful one, still don't know which one I will use for the window. besos! Luego te mando fotos para que veas como me queda la mesa para la fiesta de Isabel. Oye, entonces que? cuando publicas en el blog?